Some energy efficiency upgrades require a significant financial investment. We want you to get the most for the dollars you spend, so we have put together these suggestions to help you succeed at improving the efficiency of your home without breaking the bank. Determining which energy efficiency improvements will have the greatest impact on your comfort and energy bills can be confusing. If you heat your home with electricity, a free in-home weatherization evaluation can help identify potential energy savings opportunities. You must be present for the evaluation, which takes about 90 minutes to complete. At the end of the evaluation, you’ll receive a customized list of recommended efficiency improvements and information about PUD rebates. 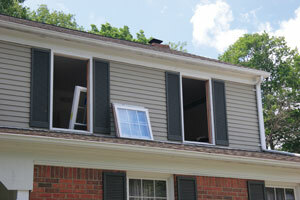 For major projects such as window replacements, insulation upgrades, or heating system changes, get more than one bid. Our Energy Experts have lists of local dealers and licensed contractors to make getting a second or third quote easy. While we can’t tell you what your project should cost, we can provide average costs for similar projects completed by our customers. When comparing proposals from multiple contractors, be sure to compare cost, energy efficiency ratings, warranties, and servicing of your equipment. The lowest price may not be the best deal. Some door-to-door salespeople are aggressive in trying to close the sale. If a salesperson says the price is only good for one day, pressures you into signing a contract immediately, or advises you against getting a second quote, don’t feel pressured to make a deal with him. There are many other contractors who will give you time to make a considered decision. Ask your friends, neighbors and co-workers for contractor referrals. Ask the contractors who give you quotes to provide references, and call them. Check with the Oregon Construction Contractors Board at (503) 378-4621 to ensure a contractor’s license is active. Our Energy Experts can help you choose the projects that will provide the greatest amount of energy savings for the dollars you spend. For example, if your house has no under floor insulation or attic insulation, and you decide to upgrade your windows, spending thousands of extra dollars to buy top of the line, triple-paned, ultra-high efficiency windows may not result in the most energy savings. You may gain greater comfort and efficiency by upgrading to a good quality, double-paned ENERGY STAR® qualified vinyl window and also adding attic and floor insulation. Our Energy Experts can help guide you through decisions like this. Measuring insulation in the attic. 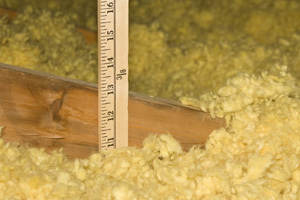 How much insulation is in your attic? Adding insulation doesn’t have the “wow” factor that new windows or an ugpraded heating system might bring, but often it is the best investment you can make. 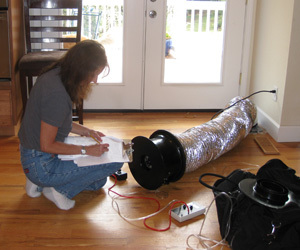 Having enough insulation really does make a difference in your heating and cooling bills. Many energy efficiency projects require a building or an electrical permit. Ask your contractor whether he will obtain permits and schedule final inspections, or whether you will need to. If your home was built before 1978, there are rules you must follow regarding lead-based paint.